Laundry mishaps have happened to almost all of us. A pen gets left in a pocket and explodes in the washer or dryer leaving ink all over the clothes and the washer drum. It could be a melting stick of lip balm that leaves spots on your khaki pants a smear of greasy wax in the dryer, or even that wonderful pair of dark jeans has now dyed the inside of your dryer the same color. Whatever the disaster, it is important to get rid of the stains from your washer and dryer drums quickly because they might be transferred to the next load of clean clothes. After you have unloaded the clothes and discovered the mishap, inspect each fabric item for stains and learn how to remove the specific type of ink that caused the stains. It is important to treat the clothes first to help avoid set-in stains before you tackle the washer or dryer. For the washer or dryer drum, the same rubbing or isopropyl alcohol that you use for first aid will remove any ink remaining in your washer or dryer tub. Use an old white towel or sponge dampened with the alcohol to remove the ink. It may take several applications and some elbow grease to remove all the ink. Keep moving your cleaning cloth to a clean spot to prevent redistributing the ink. Rinse by wiping down the drum with a clean cloth or sponge dampened with plain water. If the ink has landed on the outside of the appliances, rubbing alcohol will remove it there as well without harming the finish. As with ink from pens, start by first treating the greasy stains on the clothes. Whether it is a melted ChapStick, crayons or an in-dryer bar that has gotten overheated, it's important to remove any residue that remains in the drum. The next time the dryer gets hot, the wax will transfer to clean clothes. To remove the wax in the dryer, dampen some old rags and toss in the dryer. Set the dryer to high heat and let it run for about five minutes. This will soften the wax. Dip an old rag in white distilled vinegar or rubbing alcohol and wipe away at each waxy smear you see in the drum. Once the wax is removed, wipe down the drum with a clean cloth dipped in plain water. If there is wax on the outside of the appliance, let it harden completely (placing an ice cube on the wax will speed the process along). Use a dull plastic knife or the edge of a credit card to pop the wax off the finish. If any residue remains, wipe with a bit of rubbing alcohol and buff dry. Always purchase the type of lip balm that can be clipped to a keychain. Keys are much easier to hear jangling in a pocket as they head into the washer! We all know about dye transfer when that red sock gets into a load of white clothes and those dye stains need immediate attention. Then it's time to check your washer and dryer drums. To remove dye stains from a washer drum, add chlorine bleach to the automatic bleach dispenser or add 1 cup of chlorine bleach to the washer tub and run a hot wash cycle. This cleaning process should be done after using the washer for dying fabric using commercial dye or naturally-created dyes. For the dryer drum, mix a solution of 1/2 cup chlorine bleach to one gallon of water. Wearing rubber gloves, wipe down the dryer drum. Be careful, because the bleach solution can remove dye from any clothes you are wearing as well as any floor coverings nearby. 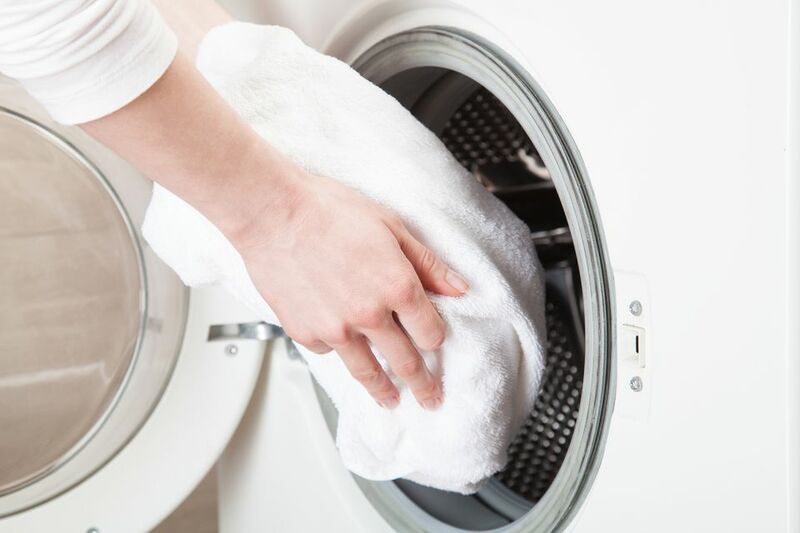 Rinse the dryer drum well by wiping down with a clean cloth dipped in plain water. As a final precaution, dampen a load of old rags or white towels and run a dryer cycle. Does Your Washer Shake, Rattle, and Roll? Help! What's Wrong With My Washer?